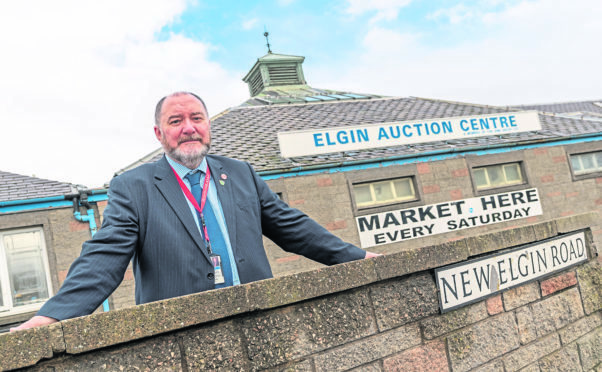 Councillor John Divers outside Elgin Auction Centre. However, Moray Council refused planning permission in principle,m arguing that insufficient information had been provided about tackling flood concerns in the area. The proposals for 101 homes is the latest initiative to be suggested for the former mart that has come to nought – following a retail park vision in 2005 and a Sainsbury’s supermarket plan. During yesterday’s planning committee meeting, Heldon and Laich councillor John Cowe stressed action was needed to make the mart capable of being developed to the standards of the former sawmill on the opposite side of the road. He said: “These are prime sites in Moray and now we’ve got a question mark over when something can be done with them. They can’t be left like that. He added: “That area of land hasn’t been known as Springfield for nothing, all you need to do is walk across it after it’s been raining to see the problems. Council officer Debbie Halliday explained that schemes to tackle surface water flooding near the mart were currently being drawn up. However, it will be 2022 before the proposals are finished and it is known whether external funding will be available. A total of 25 objections from locals were received about the proposals from Aberdeen and Northern Estates. The developer had proposed raising the land on the site to ease flooding fears. However, Sepa objected to this development due to concerns it would increase the flood risk for neighbouring properties.